Just published in June, the Fourth Edition of Preferred Stock Investing includes the latest research and updated charts and examples using real preferred stocks. It is not too often the case where the lower risk investment delivers a higher return but, thanks to the August 9 Federal Reserve announcement, that is exactly the case we now have with the highest quality preferred stocks issued by real estate companies. The unique announcement of future Fed monetary policy benefits preferred stock investors more than just about any other type of investor. Published on August 2, just as the debt ceiling deal was signed, last month's issue of the CDx3 Newsletter alerted readers that this opportunity was upon us. Quoted in last month's issue were economists from Barclays Capital, Bank of America Merrill Lynch and Goldman Sachs all saying the same thing - that faced with a 9+ percent unemployment rate and no consumption-driven inflation in sight, the Fed has no choice but to continue the current low interest rate environment for the foreseeable future. As we now know, they were right. The Federal Reserve made it official on August 9 when it announced, in unprecedented fashion, that it will be keeping interest rates (specifically the federal funds rate) at next to zero at least until the middle of 2013. Knowing this policy in advance removes an enormous amount of uncertainty with respect to investing in companies that are particularly sensitive to interest rate changes, namely Real Estate Investment Trusts (REITs). As described last month, the profit that REITs make comes largely from the spread between the return on their property rents charged to tenants and the cost of the debt service (interest expense) on the loans for those properties. You’re profitable if you can borrow cash to build or acquire a building at 7% and then make a 15% return on rents from the tenants in that building. So the profitability of REITs is directly tied to prevailing interest rates. With the Fed's August 9 announcement of future interest rate policy, REITs now know in advance what they can count on for at least another two years. A REIT, as defined by U.S. tax code, is essentially exempt from federal income tax on their profits. In order for the exemption to continue, the company must distribute at least 90% of its taxable profits to shareholders (the IRS then collects its taxes from the shareholders rather than from the company). The following analysis offers an update to last month's article on this topic. Where last month's issue gave you a heads-up that this was coming, the analysis presented here shows you exactly how the Fed's August 9 announcement has created a situation where the lower risk investment is (for the moment) offering investors a higher return. 4. High quality REIT preferreds are evaluated by rating agencies and have investment grade ratings – these company’s common stock shares, on the other hand, carry no such rating. High quality REIT-issued preferred stocks are arguably a lower risk investment than the same company's common stock but, as you're about to see, are currently offering a higher return. Figure 1 itemizes the dividend yield being generated by the 26 highest quality REIT-issued preferred stocks compared to that offered by the same company's common stock. This same table, with trading symbols, appears on page 5 of the September 2011 issue of CDx3 Research Notes, the monthly preferred stock research newsletter provided to those subscribing to the CDx3 Notification Service (my preferred stock email alert and research newsletter service). All of the 26 REIT-issued preferreds listed in Figure 1 (a) carry the cumulative dividend provision, (b) are rated investment grade and (c) are issued by a company that has a perfect track record of never having suspended a preferred stock dividend. Also note that the market price (August 17) of each of these preferred stocks is less than $25. That's key since in the event that the issuing company retires ("calls") the shares, all shareholders will receive a $25 per share cash payout. By purchasing your shares for less than $25 investors not only add a layer of principal protection, but also position themselves for nice capital gain in the event of a downstream call. Investors are use to the notion that higher risk alternatives generally provide a higher potential return. But the Fed's August 9 announcement has changed that normal state of affairs with respect to high quality REIT-issued preferred stocks, at least for the time being. 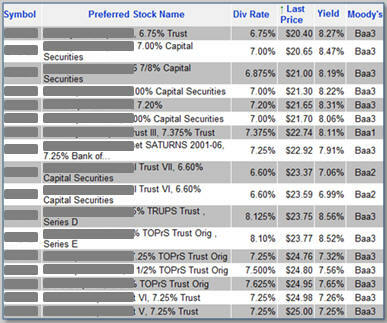 The "Pfd Yield" column of Figure 1 shows you the annual dividend yield being offered by each of these 26 preferred stocks while the "Common Yield" column provides the current dividend yield of the same company's common stock shares. These 26 preferred stocks are offered by 12 different companies. With the exception of two companies (indicated by an asterisk), the lower risk preferred stock shares are offering a higher return than the same company's higher risk common stock shares. 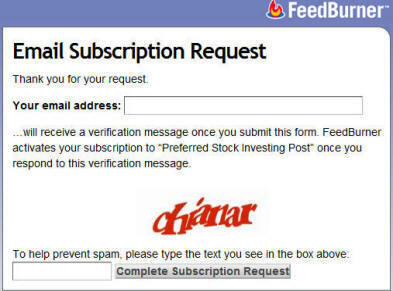 Figure 2 illustrates the unique opportunity now available to preferred stock investors. Each diamond on Figure 2 represents the current preferred stock and common stock dividend yields for each of these twelve companies. For example, the preferred stocks of the circled company's diamond offer an average annual dividend yield of 7.28% while the same company's common stock is currently yielding only 3.85%. The black line on Figure 2 is the "equal yield" line. We would expect that two investments of equal risk would be priced by The Market such that their yields were the same (i.e. the diamond would fall on or very near the equal yield line). But notice that this is not currently the case with the highest quality REIT-issued preferred stocks. In ten out of twelve cases, the diamond is below the equal yield line indicating that the preferred stock yield (lower risk) is higher than that of the same company's common stock shares (higher risk). Any opportunity that offers higher returns at lower risk tends to ultimately draw a crowd. Investors will continue to seek respectable returns (such as the average 7% offered by these 26 preferreds) at acceptable risk and that will put this opportunity on the top of the list for many. Combined with the current uncertainty and turmoil related to the financial industry (domestic and foreign) and the resulting volatility that we have seen over the last several weeks, it would be surprising if the market prices of the highest quality REIT-issued preferreds did not gradually increase accordingly. The reason that the diamonds on Figure 2 are currently below the equal yield line is that the common stock dividends being offered by these companies are still relatively low. The August 9 Fed announcement of continued low interest rates should result in increased profitability for well managed REITs over the next two years. Once those profits are realized, those REITs are required to distribute those increased profits and will likely do so by increasing their common stock dividend. In the event that they do so, the diamonds that you see below the line in Figure 2 will join the two diamonds that are seen above the line where the common stock yield exceeds the preferred stock yield from these companies. But until these companies are able to turn the newly declared two-plus year low interest rate commitment by the Fed into distributable profits, a rare and significant opportunity has been created for preferred stock investors where the lower risk alternative is providing a substantially higher return. If you want to take advantage of recent price declines in financials, this list of the 17 highest quality bank-issued preferred stocks are the issues that you should be considering. Here's why. The turmoil that we saw in financials during August pushed common and preferred stock market prices down throughout the month, producing bargain prices for high quality bank-issued preferred stocks that we have not seen in almost two years. This month there are 17 preferred stocks offered by our Big Banks that provide a potential layer of principal protection not available with many other preferred stock issues. This table presents an updated list of Big Bank-issued trust preferred stocks (TRUPS) that will be among the first affected by section 171 of the Wall Street Reform and Consumer Protection Act, signed into law on Wednesday, July 21, 2010. Section 171 created what is probably the largest single opportunity for preferred stock investors in history. Effective January 1, 2013, the new law prohibits Big Banks (assets greater than $15 billion) from counting their TRUPS in their "Tier 1 Capital" calculation, a measure regulators watch when assessing the adequacy of a bank's reserves. These Big Banks are therefore likely to retire ("call") their TRUPS. Investors who hold shares of a TRUPS when it is called will receive $25.00 per share, so investors who purchase shares now for less than $25 position themselves for a capital gain on top of the above-average dividend income that they will be earning in the meantime. The highest quality Big Bank TRUPS available for less than $25 per share are listed in this table. As this month's list of 17 Big Bank TRUPS demonstrates, it is not too late for preferred stock investors to take advantage of this opportunity. By watching this list each month, you will be able to monitor this opportunity as the January 1, 2013 implementation date approaches (expect prices to generally increase toward $25.00 per share). (Already a subscriber? For symbols see page 7 of the September 2011 issue of the subscriber's newsletter, CDx3 Research Notes). Hospitality Properties Trust (HPT) is a real estate investment trust (REIT) that owns hotels and travel centers operated by unaffiliated hospitality operating companies under long term management agreements or leases. As of June 30, 2011, HPT has invested approximately $6.8 billion in 288 hotels and 185 travel centers located in 44 states, Puerto Rico and Ontario, Canada. The company was founded in 1995 and is headquartered in Newton, Massachusetts. HPT recently launched a two-part recession recovery strategy that has paid off in a big way so far this year. First, HPT's management team has been very aggressive in its focus on the financial performance of its properties, moving to sell underperformers and use the proceeds to upgrade more popular properties. For example, in its new agreement with Marriott the companies identified 21 underperforming hotels that will be sold with $102 million of the proceeds going toward upgrades of the remaining Marriott-operated properties. Second, during the first quarter of 2011 HPT completed lease amendments with its three largest operators - TravelCenters of America LLC, Marriott and InterContinental that implement new security deposit and minimum revenue guarantees. Another big turning point for HPT has been its investment in TravelCenters of America, one of HPT's primary tenants. Prior to 2007 the privately held TravelCenters of America (TCA) was becoming a liability, falling behind in its rents. Seeing an opportunity, HPT acquired TCA for $1.9 billion. With new capital, HPT spun out TravelCenters of America LLC as a publically held subsidiary with a new management team. On August 9, 2011 the all new TCA LLC reported Q2/2011 net income of $22 million, compared to $1.2 million for the same quarter in 2010 and has $137 million in cash on hand. The last few years have been a challenge for the hospitality industry and HPT's management team has been aggressive in meeting those challenges. And the results look promising. On August 9, 2011 the company posted Q2/2011 Funds From Operations (FFO) of $0.89 per share, a 9.9% increase over the same quarter last year. Also for the second quarter HPT reported net income of $51.64 million, a whopping increase of 122.5% from Q2/2010 of $23.21 million. The company just published its second quarter financial results on August 9, 2011 showing the initial effects of its two-part strategy. Learn more about HPT: Company website | Profile | Upgrades/Downgrades | Recent News. How do I calculate the Effective Annual Return of a preferred stock investment upon its call? 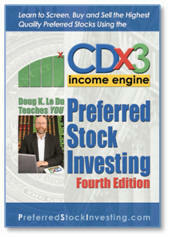 Here's a major hint: When you signed up for this free CDx3 Newsletter, you received an auto-reply email message that provided you with a download link to a free copy of the CDx3 Special Report titled "Calculating Your Rate Of Return." That CDx3 Special Report, also available here, uses a real CDx3 Preferred Stock to illustrate how to perform this calculation. The report also shows you why other commonly used methods produce an incorrect answer. The easiest way to calculate the Effective Annual Return (EAR) of a preferred stock investment is, of course, to use a calculator. Calculating Your Rate Of Return provides the Microsoft Excel formula needed to perform the EAR calculation. You can follow the same procedure using a financial calculator. 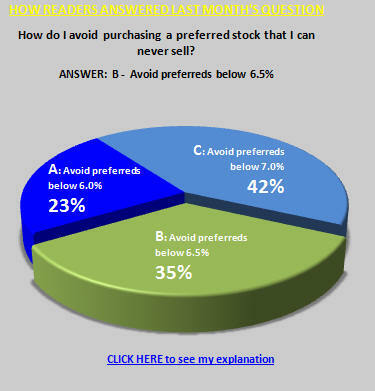 Just remember that this question assumes that the issuing company calls (buys back from you for $25 per share) your preferred stock on its call date, so use that as your sell date and sell price. When contemplating your possible buying and selling activities, knowing the EAR of your preferred stock investing alternatives allows you to make more informed decisions. The question this month for preferred stock investors: How do I calculate the EAR of a preferred stock investment upon its call? (A) Add up the total income you've earned (dividends plus capital gain) and divide by your invested amount. (B) Since the call price is $25 per share, the Effective Annual Return is the same as the annual dividend rate. (C) Calculate the quarterly internal rate of return, then compound the result for four quarters. The correct answer to this question is (C). What makes this calculation more tricky than it would be otherwise is that you have to include something called the "time value of money." The time value of money is a well known, intuitively obvious concept that is very easy to illustrate: if I were to offer you $100 today (free and clear, no strings attached) or the same $100 delivered to you 10 years from now, which would you pick? When it comes to the value of a buck, sooner is always better. That's the time value of money. Having the same money sooner has more value than having the same money later. The reason, of course, is that if you have the money now, versus later, you have the opportunity to do something with it such as invest it and generate additional returns (which you could also then reinvest in compounding fashion). That's why answer (A) is incorrect. Simply adding up your income and dividing it by the amount you have invested just gives you the percentage of your investment that you have realized in the form of additional returns. It does nothing to accommodate the time value of money. Answer (B) is also incorrect because it not only does not capture the time value of money that you realize by receiving periodic dividend payments over the life of the investment (purchase date to call date), but it assumes that you have no capital gain or loss (i.e. that you originally paid $25 per share, the same as the call price). 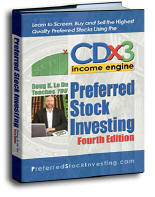 My book, Preferred Stock Investing, shows you how to always purchase your CDx3 Preferred Stock shares for less than $25, regardless of market conditions, increasing your chances to pile a capital gain on top of your dividends. To calculate your actual EAR, you first have to calculate your return for a quarter (the period over which you receive the dividend) using the Excel RATE function. The result is called the internal rate of return. Then compound this quarterly value for four quarters using this formula: [ (1 + r)^4 ] – 1, where r is the quarterly internal rate of return value from the RATE function. The result is your Effective Annual Return. The exclusive website for subscriber's to the CDx3 Notification Service provides a very robust Excel-based What-If EAR Calculator. Using the calculator, subscribers can just plug in the particulars of their preferred stock (purchase date, purchase price, dividend rate, etc.) and instantly see the EAR, dividend yield, quarterly cash income and many other key values. The calculator also allows subscribers to test trading strategies such as selling one issue and using the proceeds to buy another, calculating break-even price points and impact to income in advance. The CDx3 Special Report "Calculating Your Rate Of Return" walks you through the entire calculation, step by step, including the setup of the Excel RATE function for your preferred stock. Knowing how to calculate your EAR is essential for preferred stock investors. The Federal Reserve's unprecedented August 9 declaration that the current low-to-no interest rate environment will remain intact for at least the next two years delivered two gifts directly to preferred stock investors - (1) direction in terms of where to consider making new investments and (2) risk reduction in terms of added principal protection. The largest single cost facing a Real Estate Investment Trusts (REITs) is the cost of money - the interest rate it pays to barrow in order to build or acquire rentable properties. The spread between that interest cost and those rents is largely what determines the REITs profitability. The Federal Reserve's August 9 declaration of future monetary policy was therefore a profitability bonanza for well managed REITs. By law, these REITs are required to distribute at least 90% of those profits to us. The opportunity that the Fed's announcement created for preferred stock investors in high quality REIT-issued preferred stocks cannot be overstated. Not coincidentally, the Fed's announcement comes at a time when uncertainty related to foreign and domestic banks is once again creating substantial volatility in the market prices of bank common stocks. Another gift to preferred stock investors made possible by the Fed's announcement is price stability of fixed-income securities. The market price of fixed-income securities (e.g. 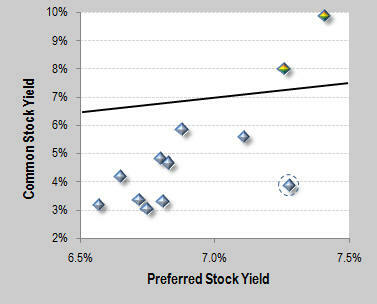 bonds and preferred stocks) tends to move in the opposite direction of interest rates. 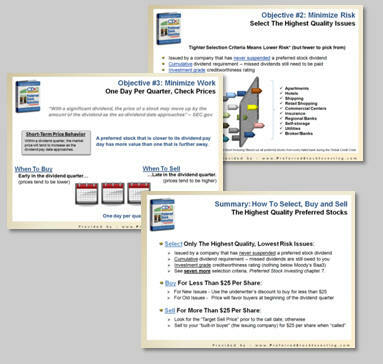 The preferred stock investing method described throughout my book, Preferred Stock Investing, uses this known relationship to manage buying and selling activities. The Fed's commitment to stable interest rates also means that preferred stock investors needn't be as concerned about decreasing prices after making a purchase since rates are now intended to remain relatively flat for time measured in years. The Fed announcement of future monetary policy may have been as ill-advised as it was unprecedented. But whatever the case, the announcement provided both direction (REITs) and risk-reduction (stable prices) to savvy preferred stock investors. These are great times for preferred stock investors. I hope you are taking this opportunity to build your personal fixed-income portfolio with the highest quality preferred stocks available.